Much has been written about the therapeutic value of BLACK GEL. For temporary relief of crusting, ulcerating and hardening of the skin. It is oftentimes used as a drawing salve for infection or splinters. 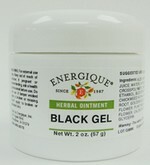 Energique's Black Gel can be used for the temporary relief of crusting, ulcerating and hardening of the skin. It is also oftentimes used as a drawing salve for infection or splinters. Blood root (root), Chaparral (leaf), organic Chickweed (aerial parts), organic Comfrey (root), organic Echinacea (root), Goldenseal (root), Lomatium (root), Mullein (flower), organic Plantain (leaf), organic Poke root (root), organic Red clover (flower). Other ingredients: water, ethanol, glycerin, NaPCA (natural hydration factor), carbomer (polymer), tromethamine (amine based organic buffer), biosaccharide gum-1 (natural moisturizer derived from sorbitol), sodium hydroxymethylglycinate (preservative derived from amino acid glycine). NOTE: For external use. Do not apply to broken or abraded skin.